Harvey Mountain is in our back yard (front yard really) and we’ve spent a lot of time skiing on her flanks and summit. Zelda had her first winter camping experience up there. We’ve known for years that from the southeast facing cliffs on Harvey, you can see the faint remains of an old ski area over at the base of South Mountain. It wasn’t until I found NELSAP did I realize that what we were seeing was called the Harvey Mountain Ski Area. 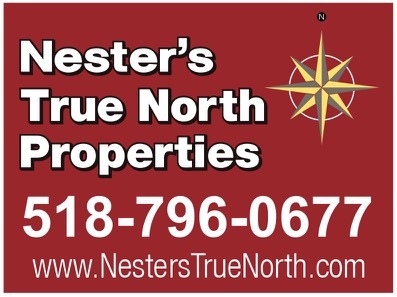 The following is excerpted from the work of Jeremy Davis of NELSAP – the New England Lost Ski Areas Project. 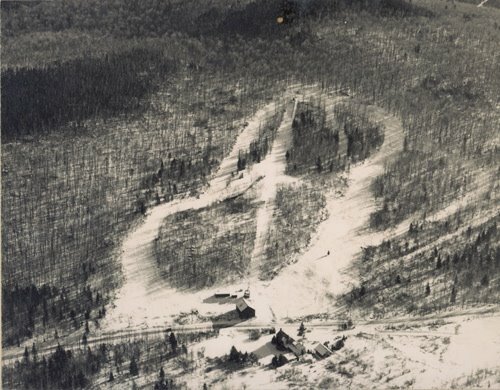 Harvey Mountain, located on Barton Mines Road in North River, NY, was a classic family owned and operated ski area that lasted 15 years, from 1962 to 1977. While modest in size (400 feet of vertical and a single T-bar), the ski area taught many to ski, and allowed skiers to enjoy an uncrowded ski experience. Bill Butler was a spice salesman from New York City. In early 1962, while on a fishing trip, he went out exploring. On Barton Mines Road, he came across some property that was for sale, that included a big stone house across the road. He had a dream of owning a ski area. The land was owned by the Barton Family. He offered $17,000 dollars to buy the property, paid cash on it, and the area was sold quickly. Bill cut the trails quickly in the summer of 1962. A new T-bar lift was installed that summer. Near the base was a horse stable that the mine had used in the past. He converted it into a warming hut for coffee and hot drinks. The ski area opened in December, but crowds were light the first year. Bill advertised in the Glens Falls paper and on local radio. Lloyd Lambert, a ski reporter based in Albany, got in touch, and assisted with the promotion of Harvey in ski reports. Later, Lambert held ski races for kids and adults, and passed out his own trophies. Located just 2.25 miles, as the crow flies, from the summit of Gore, and just a few miles away from the North Creek Ski Bowl competition was strong. But Harvey Mtn did fill a niche. There were numerous challenges the Butlers faced while running Harvey Mtn. There were issues with residents in North Creek. Some thought it was too much competition for Gore. There was also some friction from Ski Bowl enthusiasts. Signage was also a problem. Park rules left private mountains at a huge disadvantage for road signage. At the end of the 1976-1977 ski season, Bill met with the state, and sold the land. The sale was made with the stipulation that the state would not run it as a ski area, and that it would return to forever wild status. The state dismantled the T-bar lift, and tore down the stable and the warming hut. After all man-made traces were removed from the area, nature took over – and today, the former ski area is now forest. I always get wistful reading those NELSAP pieces — people creating ski areas that were doomed to fail — and Jeremy’s writing style complements the stories nicely. I’ve heard of a plane crash on Harvey Mtn. Does anyone know where it is? Bud… I had not heard this story. I do know that there is a plane on Bullhead, across the lake. I have bushwhacked across Harvey and haven’t seen evidence of this. Harvey Mountain Ski Area was actually on South Mountain, not on Harvey so maybe that is part of the confusion. I learned to ski on Harvey Mountain ski area. I was twelve, it was 1962. We skied there for a couple of years. I remember Mr.Butler and the wonderful breakfasts the cook prepared in the morning. We ate at family tables. The sleeping quarters were such that you had to go through one room to get to the next. The fireplace in the great room was exquisite. Real chocolate milk in the warming barn. 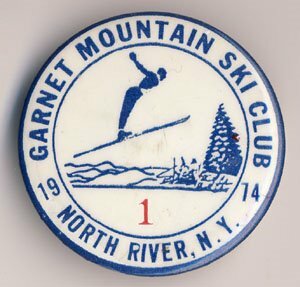 I never wore my favorite ski jacket because the rope tow would wear through the material under the arm area. I made friends with a girl my age named Serena I think. She was a natural skier, I was not. The road to get there was treacherous. Thanks for helping this memory come to the surface. I understand the ski area has returned to wilderness, I wonder if the lodge still exists? It sounds like a great experience Loretta. I have some Harvey mountain signage and would like to post pictures to your blog. Should I email them to you?